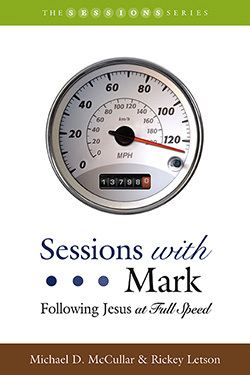 Sessions with Mark is a ten-lesson study designed to provide a compelling look at the Gospel of Mark. Each session is followed by a thought-provoking page of questions that allow for a deeper experience of the scriptural passages. These resource pages can be used by seminar leaders during preparation and group discussion, as well as in individual Bible study. Immersing us in the Gospel of Mark, Michael D. McCullar and Rickey Letson reveal Jesus as a person of intense passion, energy, and drive. Mark portrayed Jesus as powerful yet benevolent—healing the sick, calming storms, exorcising demons, raising the dead, and restoring sight to the blind. Mark’s Jesus was God on a mission. Rickey Letson is minister to adults at Johns Creek Baptist Church in Alpharetta, Georgia. A native of Alabama, he is a graduate of Samford University and the Duke Divinity School. He is also the author of Sessions with Thessalonians. He and his wife Ann Marie have two children, Callie and Caleb. They reside in Suwanee, Georgia.